Occupying a large peninsula in the northwest of France, Brittany lies between the English Channel to the north and the Bay of Biscay to the south. During the Dark Ages, the Britons were pushed south across the English Channel from Great Britain, after which the Brittany region remained a Celtic duchy for over 1,000 years prior to its annexation to France in 1532. Today, a deep Celtic tradition remains. 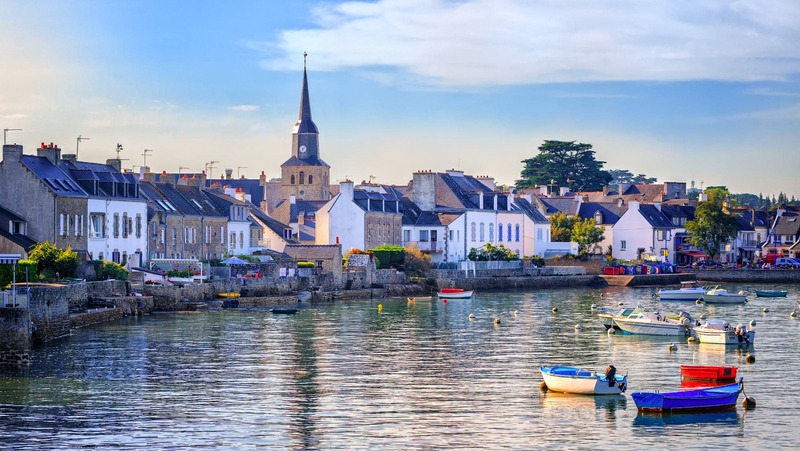 Brittany boasts a fascinating mix of spectacular coastlines, ancient fortified towns, hidden inlands, and wooded areas to explore. This morning, you will take the high-speed train two hours from Paris to Rennes, where you’ll transfer and take a 45-minute-long train ride to St-Malo. Saint Malo, whose 13th and 14th century ramparts face the sea, is a walled port city almost entirely surrounded by water, and a great place in which to begin your stay in Brittany. You’ll check into your accommodation, a quiet and comfortable hotel with views towards the harbor, and spend the remainder of the day exploring the interesting shops and small restaurants that line the city’s narrow streets. If you arrive in time for low tide, you can cross the causeway to tour the Fort National (Bastille of Brittany), or you may want to visit the city’s 15th century chateau, and take in the views of the harbor and coastline. This evening, enjoy fresh seafood and a bustling, local atmosphere over a casual dinner at a nearby suggested restaurant. Following breakfast this morning, collect your bicycles at the hotel along with suggested itineraries for a half-day cycling tour. Before you depart, stop at the local outdoor market to gather fresh cheese, bread, and fruits for a picnic lunch, unless you’d rather stop at a café along your route. This afternoon, visit the Grand Aquarium, a well-maintained aquarium on the outskirts of Saint Malo, with an impressive display of the sea life that inhabits the English Channel. The aquarium also offers a 3D cinema, a large touch pool, and rides on a real submarine. Alternatively, you may wish to rent a car and explore surrounding towns and villages in the area. St. Brieuc is a chic and charming city, with a beautiful 15th century cathedral, and a great shopping center. Stop for a drink at Les Copains d’Abord, a bar with a lively atmosphere. This evening, we recommend one of Saint Malo’s most popular restaurants, which serves local, fresh seafood. 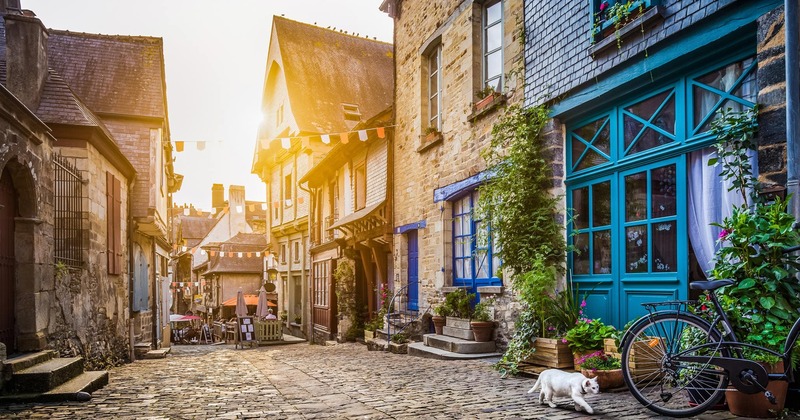 After breakfast, board your boat for a scenic three-hour trip down the Rance River to the beautifully-preserved medieval town of Dinan, set on a hillside overlooking the river. Check-in at your charming hotel, which is surrounded by lush gardens, and then set out to climb the Tour de l’Horloge, a 15th century clock tower which offers scenic views of the town. Stroll in and out of the colorful shops set among the half-timbered houses and medieval buildings in the old part of town, which feature local wood carvings, jewelry, leather, and glass. Break for lunch at one of the small family-owned restaurants in the area; we will provide you with a list of suggestions. This evening, experience Brittany’s magnificent coast from above during a hot air balloon ride. Today you will have more time on your own to explore Dinan. Return to Paris by train in the late afternoon.